Tomorrow is National Bundt Day, and Food Librarian and the food blogging community are baking more than their fair share of bundts. In fact, this is Food Librarian’s third year of I Like Big Bundts, a time when she bakes a bundt a day for 30 days. That’s a lot of bundts! Now that I have one or two or three or possibly more bundt pans, I decided I have no excuse for not participating, at least on National Bundt Day. Plus, my coworkers will expect something in the office tomorrow since I took today as a vacation day. I know, they’re demanding. I decided to make something with chocolate chips, and my google search happened to pull up this bundt on my friend Jami’s blog, Night Baking. There are a bunch of steps to this bundt–it’s definitely not one of those recipes where you throw everything in one bowl then into the pan, but the end result is a moist, not overly sweet cake. My marbling skills are apparently lacking, so the inside of my cake looks a little sad; somehow I don’t think my coworkers will mind once they take a bite. Preheat the oven to 350F. 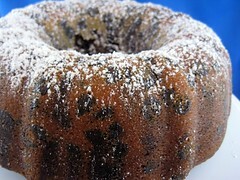 Spray or grease and flour a 12-cup bundt pan. Scoop out a third of the batter into a medium bowl. Whisk in the reserved chocolate syrup and set aside. Spoon another third of the batter into the bundt pan and smooth it with a spatula. Spoon the chocolate batter evenly over it. Pour the remaining vanilla batter over the top. Lightly swirl the batter with a wooden skewer or butter knife to achieve a marbled effect. Making a continuous figure eight motion around the pan works well. Bake until the cake springs back lightly when touched, about 60-70 minutes. Cool in the pan on a wire rack. Invert the cooled cake onto a cake plate and dust with powdered sugar if desired. Recipe from Buttercake Bakery via Night Baking. I like Big Bundts, but I’m traveling this week. I guess I’ll have to be late to the party! Oh, and my marbling skills need work, too. Oh girl, that looks just amazing! I have a Bundt pan, so I need to get busy!